Iran's Lebanese Missile Factories in "New and Very Dangerous Phase"
Recently-built Iranian missile factories in Lebanon can produce powerful weapons for Hizballah and are part of a wider trend that could set the region on fire, a senior former Israeli defense source has told the Investigative Project on Terrorism (IPT). "There is no doubt that this is a new and very dangerous stage," the source, who spoke on condition of anonymity, said about the fact that Iran has for the first time placed military production industries directly in Hizballah's possession. "It points to the fact that Lebanon is not a state, but a branch of Iran that is controlled by Hizballah, and that Iran, after the nuclear agreement, feels that it can do everything because no one dares harm it," he added. Tehran's alliance with Moscow gives the Islamic Republic "extraordinary power, and hence, Iran allows itself to do what it has not dared do without the alliance with Russia," the source said. Russia depends on Iran to safeguard the Assad regime in Syria, the source noted. Iran is testing Israeli red lines by arming the radical Shi'ite Iranian proxy, Hizballah, with potentially dire consequences. "When Israel is forced to act after Iran and Hizballah cross all of the red lines, Lebanon will be destroyed, because Iran and Hizballah have turned it into one big weapons storage facility, and the world is silent," the source said. "Anyone who dreams about Israel accepting, in a future arrangement [with the Palestinians], any kind of international force that will have any kind of role, should examine the utter uselessness of UNIFIL [the United Nations force stationed in southern Lebanon], which has yet to report on a single rocket or missile out of the 120,000 that exist in Lebanon. For Israel, UNIFIL is more of a nuisance than a benefit," the source said. Earlier this month, France's Intelligence Online magazine reported that one factory was under construction in northern Lebanon, with the second being built on Lebanon's southern coast. 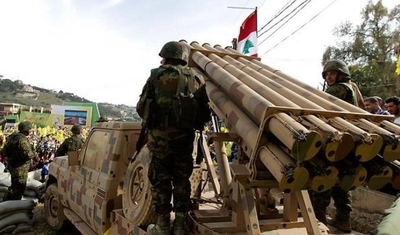 The production center in northern Lebanon was designed to make Fateh 110 medium-range missiles, which puts most of Israel in range and carries a warhead of 500 kilograms, according to the report. The IPT interviewed defense experts about the factories in March, and noted the sites represent a disturbing boost in the Shi'ite terrorist army's ability to self-produce weapons. Israeli officials have gone on record in recent weeks to confirm the factories' existence, including Israel Defense Forces (IDF) Chief of Staff, Lt.-Gen. Gadi Eizenkot, and the chief of Israel's Military Intelligence, Maj.-Gen. Herzl Halevi. Hizballah is "establishing a military industry in Lebanon with Iranian support," Halevi said. Eizenkot told the Knesset's Foreign Affairs and Defense Committee earlier this month that the Israeli military had placed the Iranian "precision project" – the drive to produce new guided projectiles, and to improve the accuracy of existing projectiles – at "the top of our priority list." The program is "mainly ongoing in factories in Iran and Syria, and they are trying to promote it in Lebanon," Eizenkot said. He also seemed to suggest there was a difference between the current threat posed by Iran's guided missile program and the future potential threat, if left unchecked. The IDF was not resting on its laurels in the face of Iran's efforts to manufacture and spread these weapons, Eizenkot said. Currently, "these abilities are very limited, and therefore, we must remain proportionate and not be alarmed. The IDF is working in regards to the [Iranian precision] project all of the time, through a wide range of tools that are best not talked about. We are working with the intention of avoiding a deterioration [of the security situation]." Emily Landau, head of the Arms Control and Regional Security Program at the Institute for National Security Studies in Tel Aviv, told the IPT that the factories "signal a new escalation in Iran's weapons proliferation in the region." Not only do they serve Iran's objective of continuously arming Hizballah, they are also designed to "overcome the vulnerability of transport vehicles transferring weapons from Iran via Syria, to Lebanon," Landau said, in reference to international media reports about repeated Israeli strikes on Iranian-Hizballah weapons convoys in Syria. Iran seems to hope that setting up missile factories in Lebanon would eliminate opportunities to attack future international weapons trafficking runs. "All of these activities are in blatant violation of United Nations Security Council Resolution 1701 [which called on making southern Lebanon a weapons free zone, with the exception of Lebanon's official army]," Landau said. "The world seems to ignore this violation. The international community should be called out on turning a blind eye to what Iran is doing. This should not be Israel's problem alone." The factories feed "into Iran's very problematic regional profile," Landau said, "which is connected to the nuclear deal as well, and should all be on the table in the Trump administration's Iran policy review." For now, Israel appears to trying to deter Iran from starting up the factories, and has reportedly issued explicit warnings to Tehran to that effect. Meanwhile, Israeli media reports say that Iran wants to create an airbase in neighboring Syria. Iran's plans include the leasing of a ground military base for thousands of Iranian-backed Shi'ite militias and a naval base. "These steps represent a move by Iran to establish a long-term presence in Syria and pose a threat to Israel," Israel's daily Yedioth Ahronoth reported. On Sunday, Israeli Prime Minister Benjamin Netanyahu issued a dramatic statement, rejecting the ceasefire in southern Syria brokered by the United States and Russia, saying it fails to suppress Iranian attempts to consolidate its military power in the war-torn country. "Israel is aware of Iran's expansionist goals in Syria, Netanyahu's office said in a statement.